"All the candy corn that was ever made was made in 1911." In a few hours I hope to be able to say that I made it through the Halloween season (which started somewhere back in July) without buying or eating one piece (bag) of candy corn. There is still one more trip to the grocery store that stands in my way of victory. But I hope to cut it short by leaving Sweetie in the car with the engine running. That way I won't be able to stand and stare (drool) at the bags of orange and yellow and white globs of sugar that make my teeth hurt just looking at them. I cannot say exactly why I like this candy so much. It doesn't have the appeal of any kind of chocolate, peanut and caramel mixture. Yet, for me it is as impossible to eat one (or one handful if we're being honest) of the triangles as a Lays potato chip. I wonder, is there really some place in my sugar crazed brain that thinks that when I'm chowing down on candy corn, I'm really eating a freshly roasted, buttered and salted ear of corn? According to Wikipedia (and we know we can trust them) candy corn is "primarily sugar, corn syrup, artificial coloring (what that isn't real yellow and orange?) and binding. What is left over after the primary ingredients is not so appetizing wax. Wax? [OMG I'm having flashbacks of summer days drinking fake fruit juice out of a mini soda bottle then eating the bottle. ] 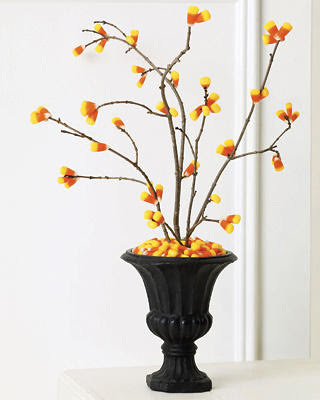 A serving of Brach's candy corn (19 pieces, but who's counting?) packs a walloping 140 calories but here's the good news - no fat. I Googled Candy Corn this morning and found, to my amazement, that there are some out there who seriously detest the stuff. They even call the people who give out this treat which has been around since the late 1800's mean names. According to Shawn Norris of guyism.com candy corn heads his list of "10 Biggest Candy Fails." In essence a list of the worst "treats" to hand out to scary looking goblins who knock on your door begging for candy then apparently have the gumption to diss what is put in their king-sized pillowcases. I'm not sure I can put much stock in Shawn's candy assessment, however, because he also includes Tootsie Rolls on the list. Seriously, if I were on a sinking ship and had to choose between taking TR's or CC with me on the lifeboat to a deserted island, I think the boat might be waterlogged before I made up my mind. There's just something about working your back teeth into the tough chocolately outer layer of a TR. Eventually when you have salivated long enough to turn the gooey mess into something chewable, the hint of chocolate you taste is worth the effort. Sure your jaw begins to ache after the third or fourth piece, but again the taste seems to outweigh the work and the pain. Alice Lausdale (blogs.dallasobserver.com)ranks CC at the top of her "Five Things to Hand Out If You Hate Kids" list. She even suggests that trick or treaters dump all their candy corn on the offending "Treaters" lawn. I'm a little offended by this. I don't hate kids. I just happen to like CC. And it seems a little harsh to put CC on the same list as raisins or bible tracts. However, I must confess here. I rarely if ever hand out candy corn. If the stuff happens to jump off the shelf and into my basket and makes it all the way home to my kitchen counter, well then I'm going to reward it's tenacity by eating it, not giving it away. All that said, there is a bright side to my beloved striped candies. They are just the right size and color for making Halloween crafts. Now given the choice between eating the sugary nuggets and stringing them individually to hang on your mantle or over your doorway which is going to attract sweet-toothed varmints. I've tried stringing popcorn and cranberries in an effort to make an old fashioned Christmas. As I recall cranberries are juicy and more popcorn ends up on your lap than the string. Getting a sharp needle to go through the point of a sticky triangle seems like more effort that it is worth. Other crafting alternatives involve a glue gun. 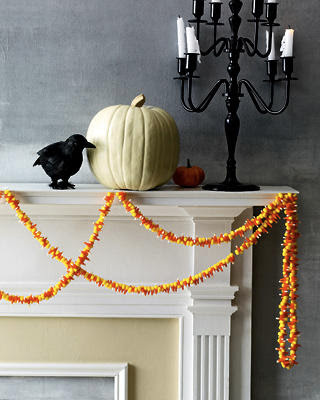 Again, I think it would be easier to hand some fake spider webs and be done with the decorating. 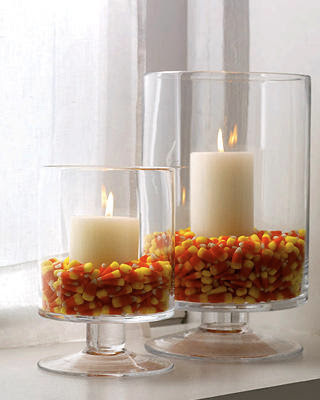 Ah, but look at this - candles surrounded pretty candies. This is my kind of decoration. And if the wax drips into the candy, well, will I even know? Perhaps as a child I enjoyed the whole get dressed up and go hobgobbling around the neighborhood. There may even have been a time in my life when I drank beer instead of eating candy in the graveyard down the street. As an adult - an old fuddy duddy adult - I think Halloween is just another ploy that merchandisers throw at the uncontrolled desires of kids and adults who remember the good old days of sheet covered ghosts and bobbing for apples. 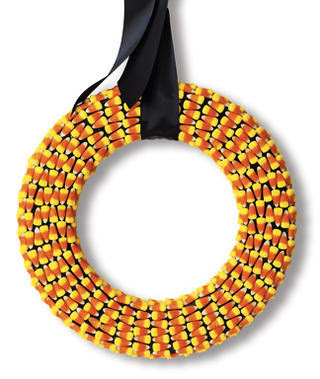 Cecelia Hanley of CBS Atlanta wrote last week that Candy Corn "is as American as Apple Pie." 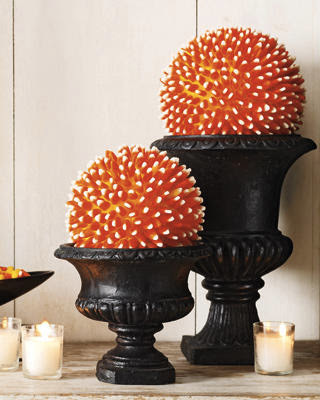 and that "when it comes to candy corn, people either love it or hate it." I'm on the side that hates to love it. Hanley quotes Nicole Stokesbury DePalma when she wrote on FB, "I totally consider candy corn an actual vegetable during the fall season." Even I think this is a pretty big stretch. What side of the sugar debate do you fall on? Today I'm grateful for the sweet things in life. The different craft pictures using the candy corn are wonderful! Personally, I don't like the stuff. Hope you make it through tonight without succumbing to the sugar monster. Little victories like that are sweet - no pun intended! Oh My Godstars this is too funny Mary! I saw a cartoon a few years back of some Witches, Old Haggy Witches, peeling off their socks after flying around on Halloween night and to my wondering eyes should appear but their toes made of candy corn, and they sat their picking them, ha ha ha ha ha! I have never looked at candy corn the same way since! I loved the crafty ideas you've shared though I would hardly have the patience to make something like it save for the candle craft.